I would first like to start this post off by apologizing to you for my absence on here. I have been very busy with life and when it came down to having free time, I just felt so unmotivated to blog. I had a bit of a break but now I'm back and I'm very excited to be writing more & more blog posts! I am a absolute book worm. I have always loved reading ever since I was a little girl. I would always beg my mum to pick up a new book for me from the library every time I knew she was going into town, then I would most probably finish the book in just a few days. 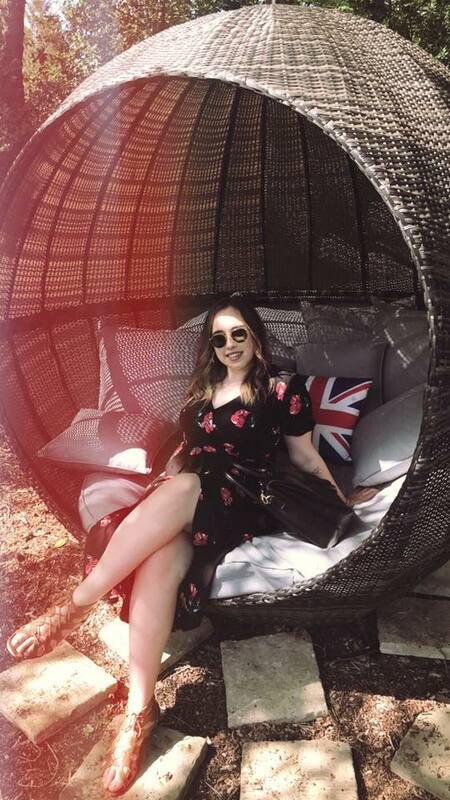 Ever since I discovered the wonderful world of social media, I felt like I became a lot more distant to books and I never really cared about them because I was too busy being on my laptop or my phone. I have only just recently been starting to get back into reading and I realised how much I actually enjoy it. I just love the idea of taking my makeup off after a long day, making a cup of tea and snuggling up into bed with a good ol' book. As I've been reading quite a lot of books, I have decided to do a monthly series on my blog showing you all what books I've been reading and also what I think about them. 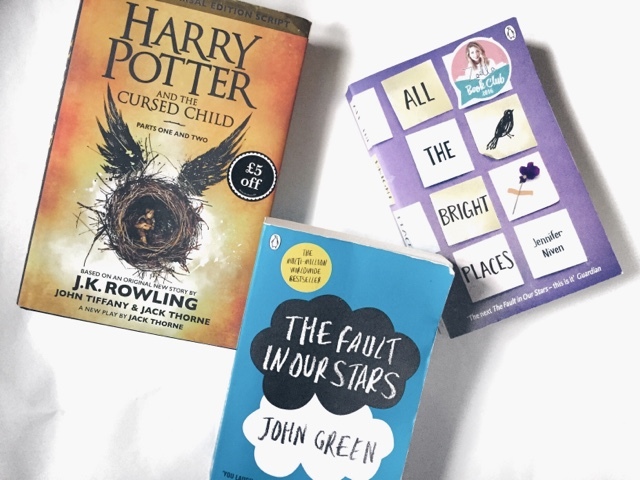 I love finding some good book recommendations so hopefully these posts will give you a chance to discover new books that you may possibly haven't read before. I love Harry Potter. The books, the films, the characters. Everything about Harry Potter, I just love. Of course, when it got said that there was going to be an eighth Harry Potter story coming out I immediately got very excited. Harry Potter & The Cursed Child is actually a play based on an original new story by J.K Rowling, Jack Thorne and John Tiffany. It's a two-part west end stage play which I tried so hard to get tickets for but they sold out within hours which was so incredibly sad. This book is the whole entire script of the play. I heard a lot of mixed reviews about this before I read it, some people just simply didn't like the fact that they were reading a full on script. I admit, it was weird at first but I really got into the book and then I kind of liked the idea of this whole script thing. Without giving anything away for those who haven't read the book yet, the story follows Harry's son Albus going off to Hogwarts himself, bumping into new friends and causing a bit of trouble throughout. That's all I can possibly say without giving anything spoilers haha. I personally loved this book and I feel like every Harry Potter fan should read this. (I don't have a picture of the book at the moment as my boyfriend's mum is borrowing it from me, sorry!) Everyone and their mother has been going on about this book so of course I jumped on the bandwagon myself. I never usually read thrillers because I like love stories too much however this was a very good read and it was one of those books that I couldn't put down. The book is split into three different characters; Rachel, Megan and Anna. Rachel is an alcoholic who takes the same train to and from work each day. The journey takes her through the back of the houses on the street where she used to live. She becomes obsessed with this couple who live at number 15, until one day she sees something that startles her and then finds out that the girl from number 15 has gone missing. There's so many twists and turns in this book that it constantly kept me on edge. When I finished it, i immediately took a trip to the cinema with my boyfriend and watched the movie which as only recently been released. The film was good however the book was 100x better. I actually read this book a few years ago way before the film came out, I have recently re-read it again and fell in love with the story all over again. It's by far my favourite novel and the movie is also one of my favourites. I do love reading a good ol' love story and this one really did pull on my heart strings. I'm sure many of you have read this book or seen the film but for those that haven't, it tells the story of a girl called Hazel who has cancer. Her mum sends her off to a support group where she ends up meeting Augustus. They strike a bond immediately and the story follows them both on their adventure to meet Hazels favourite author. You will need a whole lot of tissues when reading this book and whilst watching the film. I fell in love with this love story and it was one of those books that actually stuck with me for a few days after reading it. Another love story book... can you tell I love these kinds of books? This was another one that really pulled on my heart strings also and you will need a packet of tissues when reading this haha! The story starts with Violet and Theodore who both meet at the top of the bell tower at their school. They're both wanting to jump to commit suicide for very different reasons - Violets sister sadly passed away and she blames herself for it where as Theodore has a mental illness. The story follows them forming a wonderful friendship and shows their journey of love and adventures. I did a whole review on this book over here if you'd like to check it out. This story was just beautifully written and I believe there's rumors that the film to this is coming out some point next year which I am very excited about! So, those are the books that I have currently finished reading. I am reading some more at the moment which I will be sharing with you once I've finished them. I'm very excited about this little monthly series as I love to share book recommendations and I love finding new books to read so if you have any recommendations then please let me know! Makeup Revolution has to be one of my favourite drugstore beauty brands on the markets. They do the most incredible dupes for high end brands such as Urban Decay, Too Faced, Real Techniques and many more. 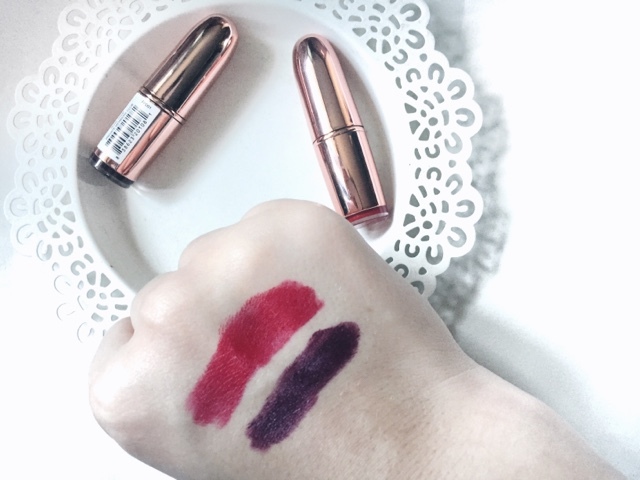 On my birthday, my best friend and fellow blogger Taylor from tmaemakeup got me these two Makeup Revolution lipsticks from there new rose gold range. Red Carpet - A traditional classic red. It's more on the brighter side rather than a darker red and I believe that this colour would suit all skin tones. It has a creamy formula which can be built up for a more intense look. I have worn this lipstick to work for a 10 hour shift and only had to touch up once which was after I ate lunch. It lasted me through the whole day! Private Members Club - I do believe this is the darkest lipstick I own. It's a gorgeous dark purple shade and I find it to be very similar to MAC Rebel. I find myself wearing this lipstick a lot more now that we're in the autumn/winter season and I ALWAYS get complimented on it. It has the same creamy formula as Red Carpet and it also has the same longevity. 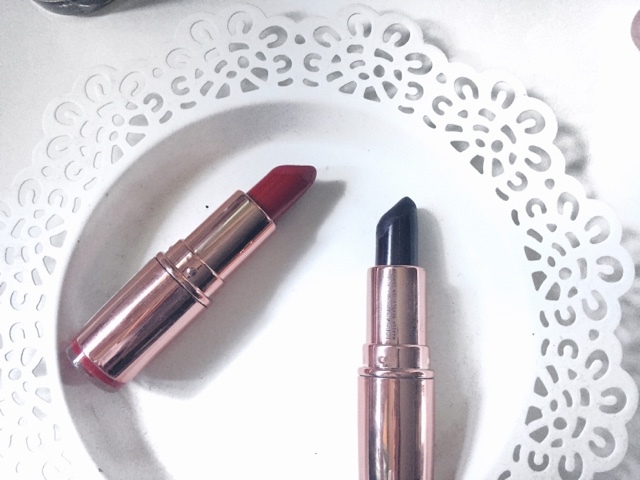 Both of these lipsticks have a satin finish to them and I find the longer I leave them on, they end up drying to a comfortable semi-matte finish. With the price tag being just £3 each, I really don't think you can go wrong. I am very impressed with the quality of these lipsticks and I'm planning on getting the rest of the collection. I recommend everyone to check these out either on the Makeup Revolution website or over at Superdrug as I think they're definitely worth the hype. 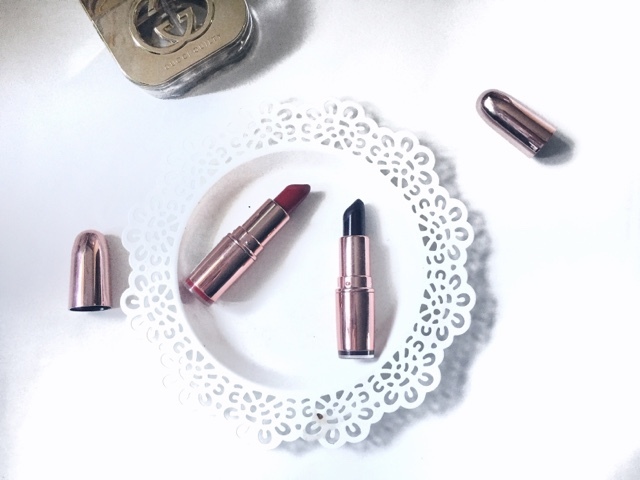 Have you tried these lipsticks yet?